We've all been there before. Roughing it in the woods for a few nights while facing the elements and putting up with the mosquitoes and black flies. We love the freedom of camping under the stars, heading out at first light seeking wildlife to capture with our camera lens and cooking breakfast over the open flame of a fire. We feel like real men (and women). There's nothing better than bragging to your friends after a week of being outside in the middle of the wilderness for a few days. 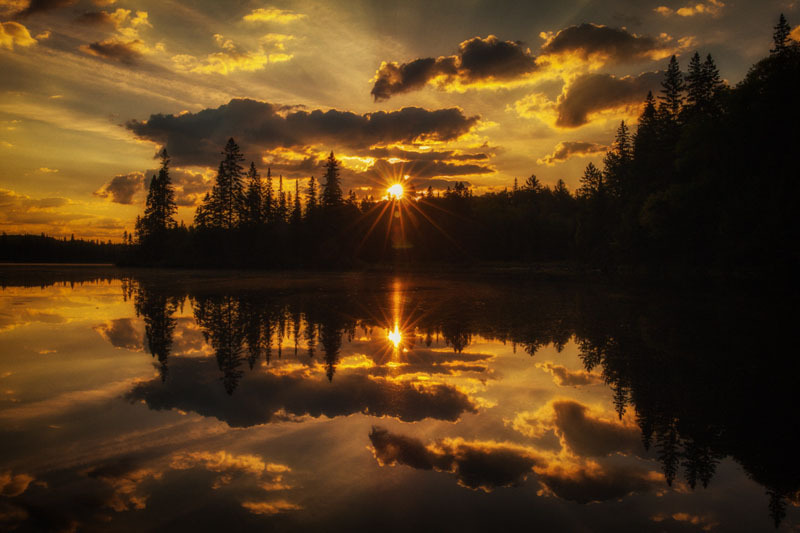 Algonquin Park in Ontario Canada is one of the premier spots in the country to go on a canoe and camping trip. It's a 7600 square km region filled with wildlife and it's one of the best places in the world to see moose! 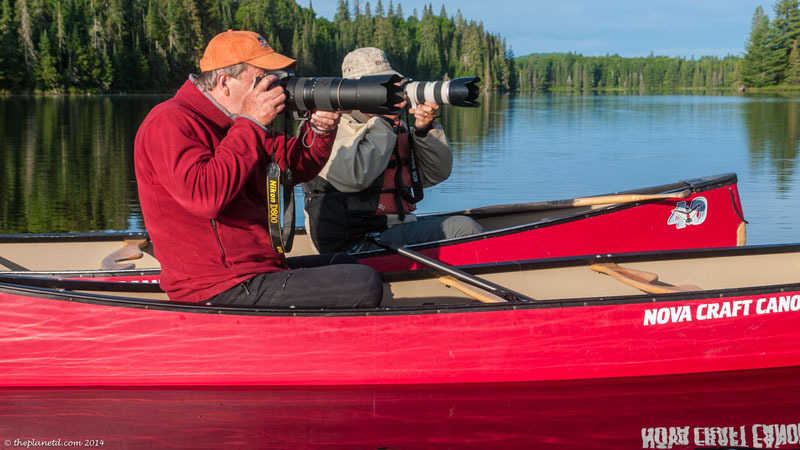 We joined award-winning wildlife photographer Rob Stimpson on his annual moose photography safari. 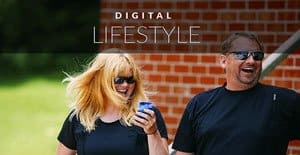 For a few weeks each Spring and early summer, he takes clients out to his secret spot to view these majestic creatures in their natural habitat. Paddling through a few different lakes and a taking a couple of portages to get there, we arrived at our campsite somewhere in the middle of the park to begin our amazing expedition. It wasn't long before we were back on our canoes in search of the great moose. We spent two days paddling to areas that moose frequent for their morning and afternoon meals and we saw everything you could ever ask for. It's rare to see a mother with her calf and it was the first time Dave and I ever saw a bull moose in the wild. We saw moose swimming and running through the water and we were so close to them at one point, we could see the bugs flying around their newly formed antlers. It was an incredible experience to camp on an island in the massive Provincial Park knowing that moose were all around us. Algonquin park houses black bears, wolves, beavers, otters, fox and hundreds of different bird species. When you go camping and canoeing here, you are truly in the great Canadian wilderness. Everything you bring in, must go back out. Canoes are filled with food and camping items and all garbage and waste is put back on your canoes and taken home with you. 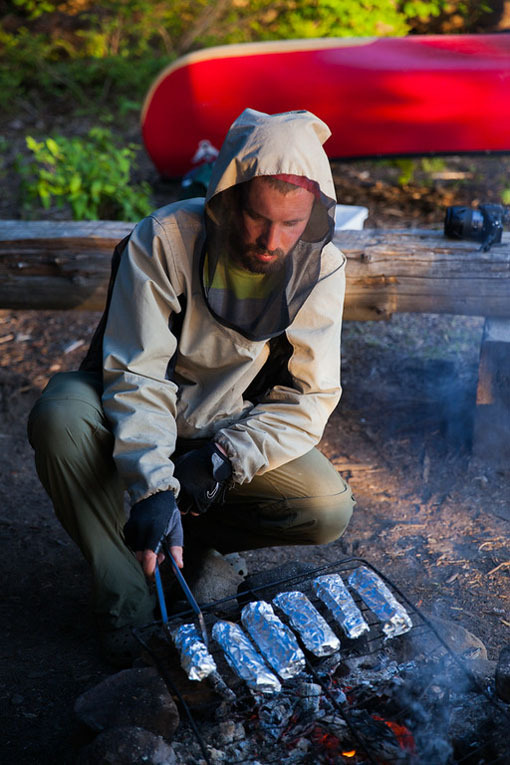 Meals are cooked on portable camp stoves or campfires. Bug jackets are worn to protect you at dusk and wooden toilets are placed over holes dug in the ground at the end of a path leading 100 meters from the campsite. It's rugged and rural and absolutely spectacular. 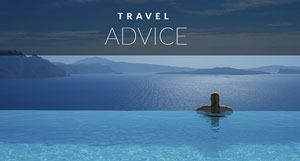 However, even the most adventurous of people love a little pampering. After days without a shower and the smell of firewood and bug spray clinging to your skin, a little bit of luxury is a welcome sight. 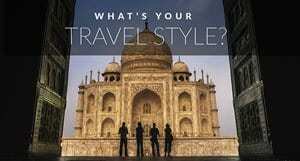 Voyageur Quest offers customers the best of both worlds. We had a few days outside with Rob photographing moose and glorious sunsets and then made our way to their luxury cabin in the middle of a lake. 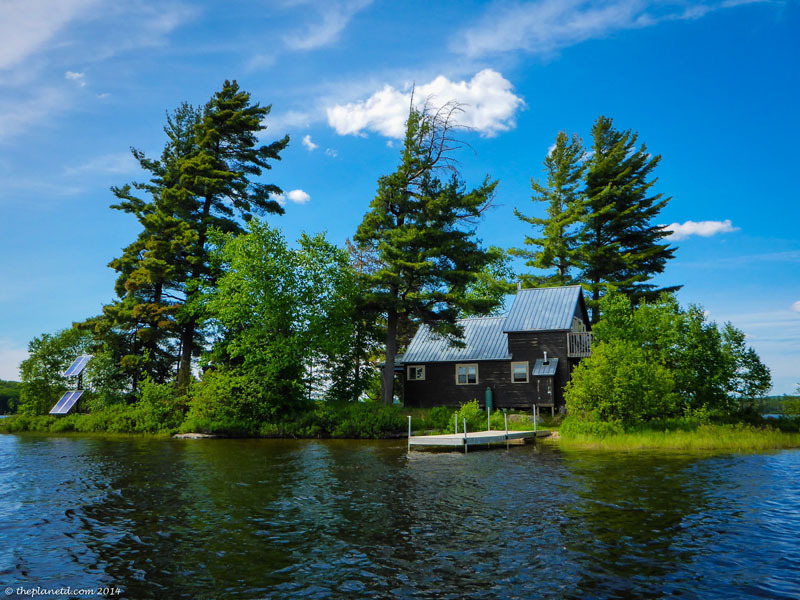 Owner, John Langford bought the historic cabin for his future retirement, but in the meantime, offers it to guests seeking a longer trip and a nice break after their canoe and camping safaris. We opened the cabin door and let out an audible sigh as we explored the modern kitchen, beautiful twin lofts and cozy sitting room. Famous Canadian artist Tom Thompson spent time at this cabin visiting the local park ranger who lived here. 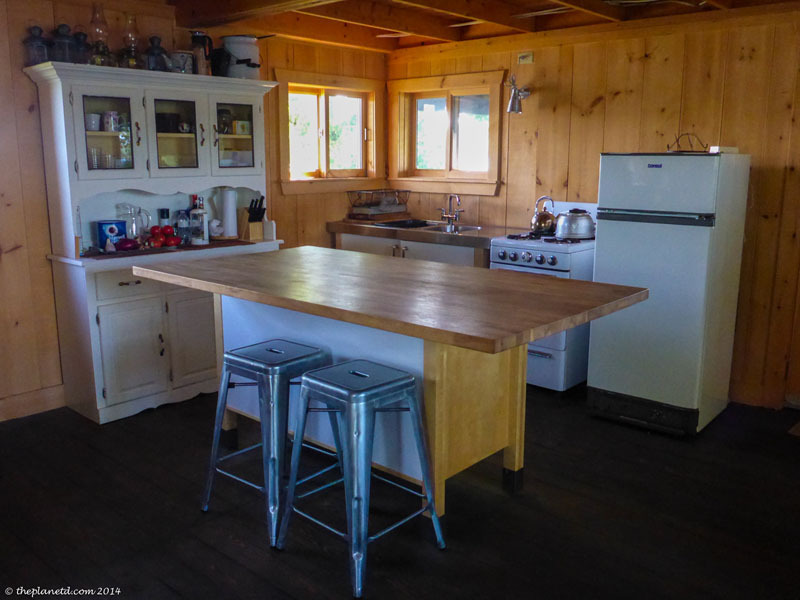 John Langford had always spotted this piece of land from his Voyageur Quest headquarters and once it became available, snatched it up, remodelled and renovated and made a quiet sanctuary for guests. People can order meals and have food delivered so that they don't need to bring their own groceries and they have full use of the unique floating sauna. Yes, I said a floating sauna. 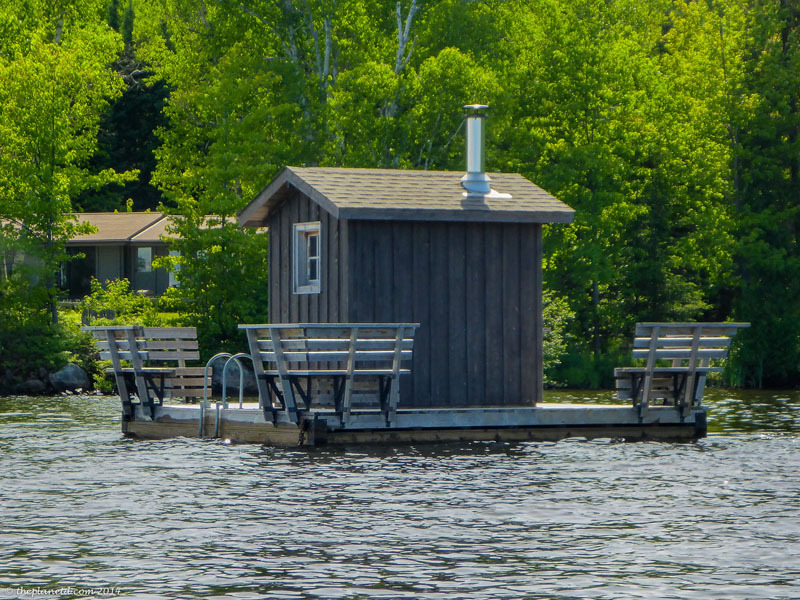 John built a sauna right in the middle of the lake where you can either swim to from his shoreside chalets or take a boat from his private island retreat. You can spend an afternoon here heating up in the sauna and then jump into the lake or even sunbathing on the dock. It is fed by wood and is one of the hottest saunas we've ever visited. Don't worry if it is too hot for you, you can open a window to cool off if needed. We had an amazing couple of days hanging out here, reading books and going for short paddles to explore the surrounding islands. 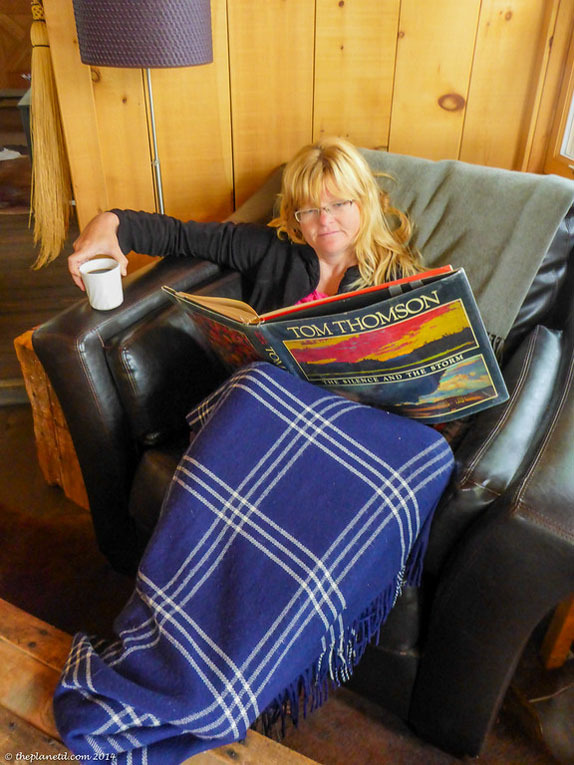 I think my favourite part was reading all about the Group of Seven. It was this area that the famed Canadian artists used as their muse for their innovating painting styles in the early part of the twentieth century. To think, Tom Thompson, an inspiration for the group actually sat in this cabin looking out at the same awe-inspiring sunset we were looking at right now. 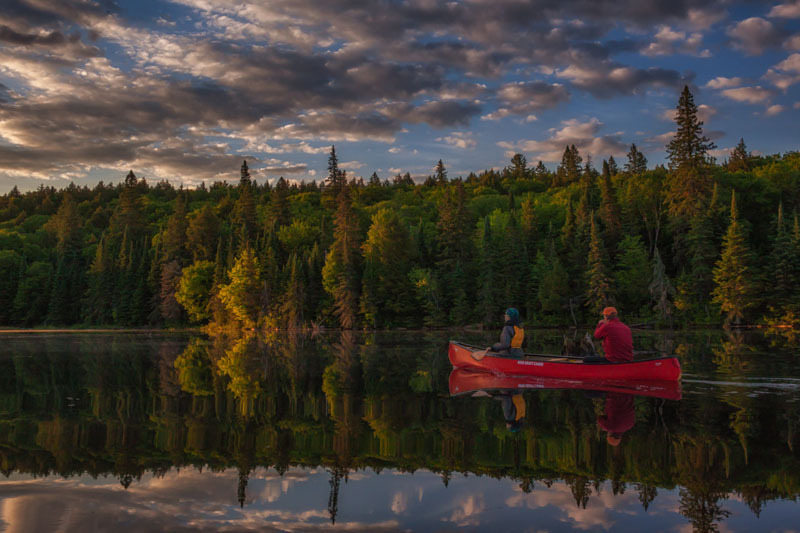 We joined renowned wildlife photographer Rob Stimpson on a photography canoe trip to his favourite haunt for moose spotting in the world famous provincial park. Algonquin Park is one of the premier places in Canada to see moose and we had an encounter with many. For more information on Moose Safaris and Alquonquin Park tours visit the Voyageur Quest Website. To check out the award-winning wildlife photographs of Rob Stimpson visit his photography website. 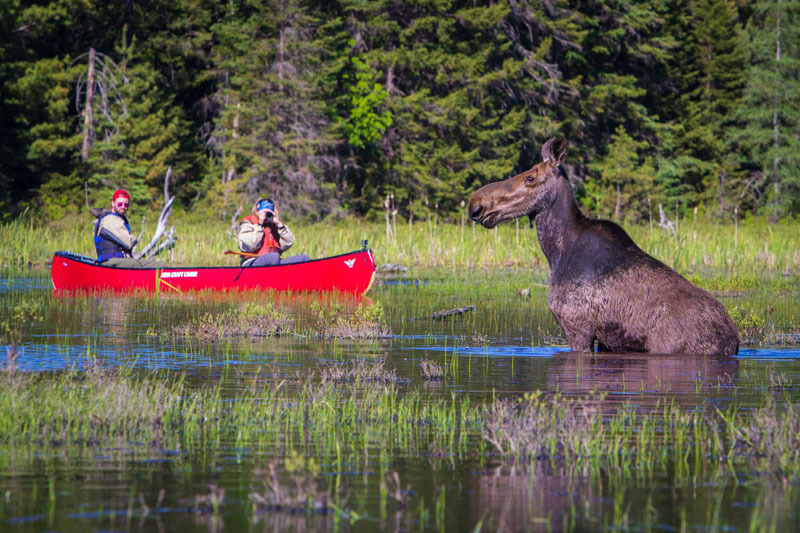 « Going on a Moose Safari – It Doesn’t Get More Canadian Than This! 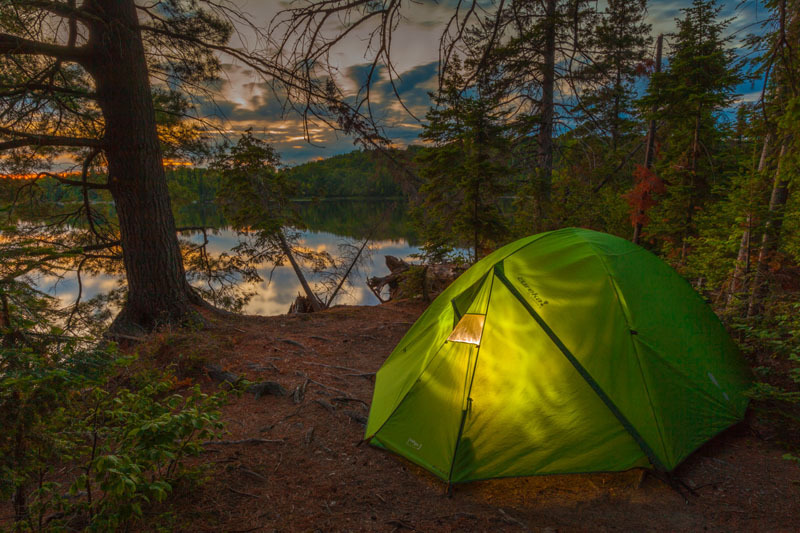 15 Responses to "Algonquin Park Canoe Trip and Camping in Luxury"
How beautiful and fun. What an amazing boat ride and scenic view. Especially love the luxury cabin rental. Very large, cozy and in a lovely location. I really love Algonquin Park.for me ,it’s a small piece of heaven. It really is isn’t it. I love it first thing in the morning, I find it so beautiful at that time. I really love to see Algonquin Park. I will must share this in my Fanpage too.. Thanks! We appreciate you sharing! 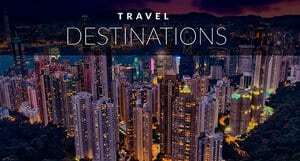 Luxury travel is not so good. With camping, it feels closer to the nature. It is just like the real life. I like mixing it up. YOu definitely feel at one with nature when camping and I think that camping is a far more fulfilling experience than luxury travel. We love pushing our boundaries and letting go of all material things. It is nice to come back to civilization though and have a bit of pampering too. I think everyone should try to mix it up. (well maybe not the campers) but the luxury people should giving nature a try once in a while, they’d realize how much more fulfilling it is! The kitchen was great! We had dinner with John and he made us a feast on the bbq with some fresh grilled veggies on the stove. This cabin has everything you need to escape and relax for a few days. It’s purely Canadian. I say if you want a true Canadian experience, head over to Algonquin Park for a canoe trip and then end at one of the Voyageur Quest cabins. Cottages are a big part of our lifestyle here and these cabins give you a feel of what it is like to stay in a cottage. Algonquin Park is a great way to visit for relaxing. I like the floating Sauna photo, it’s great.. It’s definitely a great way to unwind. 🙂 Thanks for sharing this. That floating sauna is awesome isn’t it? An entire afternoon could be had just hanging out there. Algonquin park is pretty special. I don’t think I’ve seen scenery like it before. The lakes and the reflections are astounding.